The theme for school holidays events this April is storytelling – the perfect excuse to look at one of the all-time greatest hits of children’s literature, the Arabian Nights, known in Arabic as Alf Layla wa Layla –The Thousand and One Nights. Their Chief in a low but distinct voice uttered the two words, “Open Sesame”. 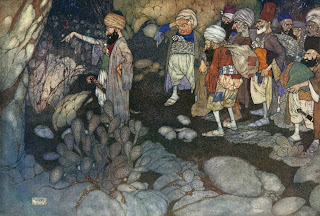 Ref: Plates from Stories from the Arabian nights / retold by Laurence Housman; with drawings by Edmund Dulac. New York: Hodder and Stoughton, 1907, Sir George Grey Special Collections, Auckland Libraries, IL: 1907 DULA. Storytelling is one of the repeated themes of the Nights, with the collection well-known for its ‘stories within a story’ framing device. In most full editions the Nights begin with the tale of the jealous king Shahriyar, who is a serial killer of wives – marrying daily and executing his brides the next morning. Into this deadly situation steps Scheherazade, the vizier’s daughter and an expert storyteller. Recently a customer called into the Central Auckland Research Centre looking for a photograph of his uncle published in the Auckland Weekly Newsin 1943. 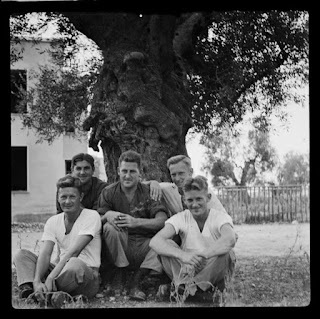 He said the photograph was the first indication to his family that his uncle was no longer a prisoner of war. A search of the Heritage Images database produced no results, which is not uncommon as many of the images from the Auckland Weekly News have a caption but few of the people are named. There is, however, ongoing work to rectify this. Anzac Day is just a week away and this year's Anzac Day is the centenary anniversary of when it was first observed in New Zealand. 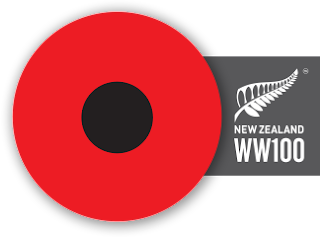 Every year, we at Central Auckland Research Centre, issue a blog challenge in honour of Anzac Day and the people that served and their families. The first blog challenge was issued in 2011, and has become an annual event. During the last five years, the challenge has broadened out to include any wars that Australians and New Zealanders were involved in. Anzac Day has grown to include remembrance of all who served in any conflict, and when we stand together at the services we remember all who served. As nations with a large percentage of immigrants, we also remember all nations. Family history is an international interest, so this year, this blog challenge can also be broadened out to include tributes to those of other nationalities. Ref: excerpt from the New Zealand Herald, 31 July 1926, page 18. In The History of New Lynn, it was claimed, unusually for the time, that the architect of the Delta Theatre was a woman. However, contemporary newspaper reports on the ‘Leaky Picture House’ vary as to whether Miss Mitchell was the building contractor or the architect. The theatre was closed in 1928 because of subsidence and reopened in 1929, the Auckland Star reported upon its reopening on the 21 May 1929. Ref: Delta Theatre, 1930, New Lynn Print Collection, West Auckland Research Centre, Auckland Libraries. 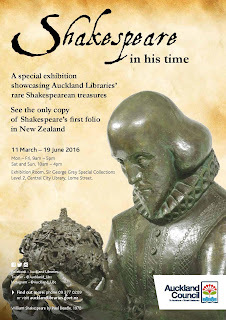 The current exhibition, ‘Shakespeare in his time’, on now until June 19th, showcases rare Shakespearian treasures alongside specially selected items from our Sir George Grey Special Collections which explore the world that Shakespeare lived and worked in. Featured in the exhibition is the well-known Shakespeare Beadle bust, created three centuries later than any other piece. Usually residing on Level 2 of the Central City Library it shows Shakespeare contemplating the world which he holds in his hands. This bronze bust was created by Professor Paul Beadle through a commission from the Auckland City Council. The plaque below this sculpture, however, doesn’t tell us about its complicated, and mostly unknown, history. Ref: Paul Beadle, Bust of Shakespeare, Bronze, 1970. April marks the opening of applications for the fourth year of our Researcher in Residence scholarship. 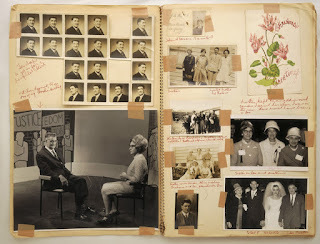 Ref: John A Lee, Scrapbook, 1960s/70s, Sir George Grey Special Collections, Auckland Libraries, 7-C1902. The Auckland Library Heritage Trust, in association with Auckland Council, is offering a research scholarship for the Sir George Grey Special Collections at the Central City Library. Ref: Reed Dumas collection, 1844, Sir George Grey Special Collections, Auckland Libraries, 7-C1943. To acknowledge International Map Year we’ve selected some of our heritage photos of surveyors at work in New Zealand in the 1920s. Surveying is the process of measuring three-dimensional position of points and the distances and angles between them. As well as being the basis of many maps, it also is used to establish boundaries of land ownership. 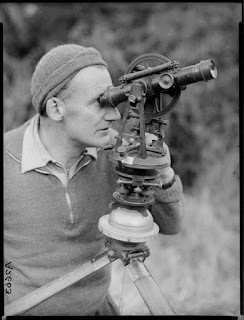 Renowned Auckland photographer Clifton Firth documented surveyors from the Department of Lands and Survey in the field, the office, as well as the equipment they used. Ref: Clifton Firth, Showing a man using a Lands and Survey Department theodolite, 1920s, Sir George Grey Special Collections, Auckland Libraries, 34-LAN-1. Ref: Clifton Firth, Showing hands running a survey line to a survey peg, 1920s, Sir George Grey Special Collections, Auckland Libraries, 34-LAN-2. Ref: Clifton Firth, Showing a Lands and Survey Department theodolite, 1920s, Sir George Grey Special Collections, Auckland Libraries, 34-LAN-5.